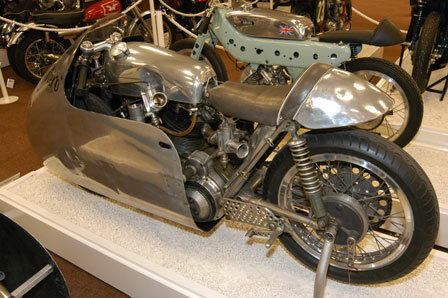 Supercharged 'super Nero' was the natural successor to 'Nero', George Brown's legendary Vincent twin sprint record breaker. Nero has broken vurtually every National course record and set a World record for a standing kilometer at 108.73mph, but after ten years was at the end ot its development. Nero, buikt originally out of a written off wrecked Vincent road machine though fitted with telescopic front forks and twin shock rear suspension to suit George's preference, but the new Super Bero was much more radical, apart from the fitting of a hige supercharger capable of supplying a 1500 ec engine. This time George and his brother Cliff built a lightweight tubular frame to make the machine longer and lower. This was to reduce the tendency for the power to lift the front wheel, a tendency from which Nero suffered. 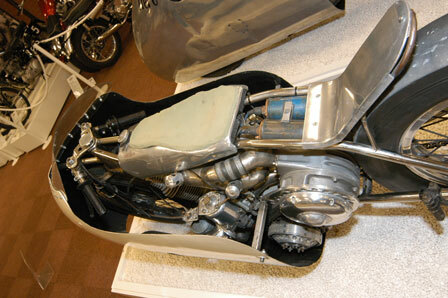 To save weight, front forks frm a 70cc Honda stepthru were fitted and the spare space in the gear box used as an oil tank. 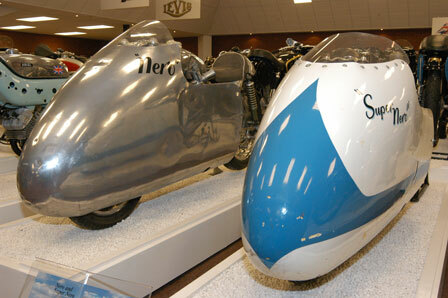 Super Nero was soon breaking the solo and sidecar records set by Nero. George, now completely committed to sprinting, his road racing career ended by serious crashes which had scarred him for life, went faster and faster. A big bore 1300cc engine was built and a spare engine so that he could contest more classes at the same event and at Greenham Common airfield the Super Nero took seven World & Naional standing start mile and flying kilometre records. In the flying start kilometre runs, the 1000 ec machine was faster that the 1300 with 158.238 mph against 149.732mph. George had a secret ambition to be the first British rider to top 200mph on British soil, over a measured distance. He had already been docked on Super Nero over a finish line at Elvington Speed Meeting at 236mph. The problem was there was nowhere in the country where Super Nero could be safely extended to its limit and various attempts on aerodromes were often ruined by bad weather. There was another, almost ridiculous problem. The FIM, the international body governing record attempts, has an arbitrary age limit for riders fo 55. At 55, George Ccomplained bitterly to the FIM that he was perfectly fit, probably fitter that many riders who were younger. He was allowed to go for National records and might soon be going faster than world records. He had made his point and in 1968 the ban was lifted. George celebrated by setting a new National & World record for the flying kilometre with a two way mean average of 182mph. Super Nero's rear tyre was worn down to the canvas after those runs. His last chance of going for that elusive 200mph was ruined by gusts of wind which blew him 10ft off course, but with sidecar attached, Super Nero set a new World & National records for the flying half mile of 128.234mph. That same year, 1970, he had his first heart attack and his sprint days were over, but he had seen his son Tony, show that he could handle Super Nero by setting a National flying quarter record at 146.7mph. George refused many tempting offers for Super Nero, but did once say "I expect it will end up in a museum". George died five days later after his 67th birthday.